The subject of this relief is puzzling. When it became part of the V&A collection, experts suggested that the scene was a rare version of an episode from the Bible. The New Testament describes how the twelve-year-old Christ was discovered at the Temple of Jerusalem by his family. In the later Middle Ages this incident was usually shown with the young Christ surrounded by the elders in the Temple. If this interpretation is correct, the adult figures on the left would be the Virgin and Joseph. The Virgin, seated on a tree-trunk, leans anxiously forward to speak to Christ. The High Priest , now headless, stands in the pulpit behind him. To the right two more female figures look on. The one at the front is sitting on a folded chair. However, there are several arguments against this interpretation. The headdress of the female figure in the left foreground makes it very unlikely that she is the Virgin. The young Christ is always shown surrounded by male rather than female figures in the Temple. The pulpit is in the centre and the female figure on the right is looking up at the now headless figure standing in it. All these features suggest that the scene shows someone giving a sermon. Or it may show a miracle that involves the child at the centre of the scene. The group probably stood in the main body of a medium-sized retable. A retable is a shelf or frame above the back of an altar that encloses decorative panels. 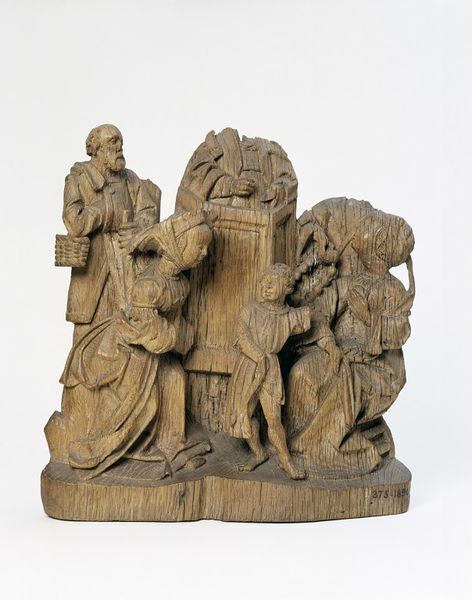 Williamson, Paul, Netherlandish Sculpture 1450-1550, London: Victoria and Albert Museum, 2002. 160p., ill. ISBN 1851773738.